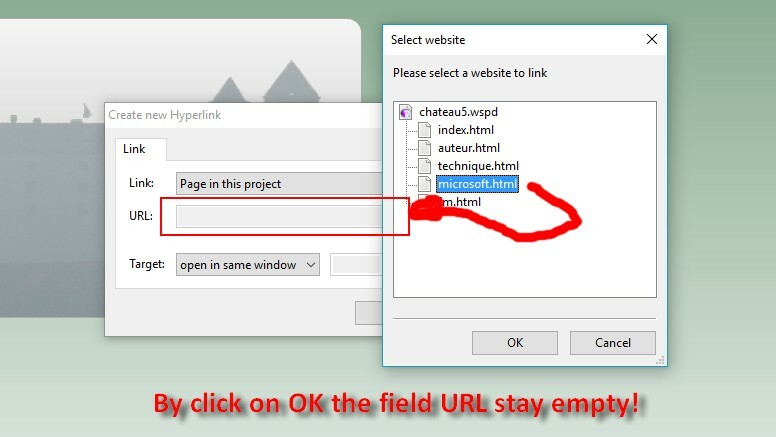 Create new Hyperlink do not work! I have a strange problem. In my main page, I have many buttons to call another pages in this project. I added a new button, but when I select the hyperlink page, nothing is added to the URL field! That's strange. You could try to remove the microsoft.html file and create a new page, and paste everything into there. And then try linking that one. Hopefully it works then. Maybe you could also send me your .rcd file, so I could have a look and see what the reason for this problem is. Thanks for your help. I did like this to resolve this problem. I made a copy of the microsoft page and linked this new page. I deleted the old one, renamed the new page and now it work. Software: Ambiera Light Forum. © 2008-2019 Nikolaus Gebhardt, Ambiera e.U.